What format you use basically boils down to paper vs electronic. Inside of each of these there are several options and a lot of these, especially with paper are customizable and can take in to consideration what fits you best in terms of both goals and journaling style. There are several option to write things down that range anywhere from under a dollar to over $50. The least expensive option is to buy a simple old composition book. If you time it right and buy it during back to school you can cover your journaling for the year (or two) for under a dollar. The pro to this, other than cost, is that you can make it anything you want. You can even use one daily and one to track strength and benchmark progress. The main drawback is the same. You have to set it up. This takes time and energy at least until it becomes a habit. Fitness journals, like paper planners, have become big business lately. With that surge in the market has come a ton of different options. No one option is the best. It comes down to what you will use and what works for your tracking style. The Gym Gypsy planners are released quarterly and are a one size fits all solution. They basically provide the means to log everything you need to log daily from work outs to food. They are predated and released seasonally. Journal menu provides a way to custom create the perfect journal for you. You can change everything from the cover to the pages inside to suit exactly what you are looking for. Options for everything from tracking lifting, running, swimming food and even yoga are available. Feel free to type up your won but to save time download and print this PDF. It has everything you need for a basic workout tracker. A decade ago there was a single CrossFit app. There are too many to count at this today. Most of them are ideal for a more minimal workout tracking for benchmark workouts and lifting PR’s. There are some more tailored to weightlifting if you do more of that. These will allow you track sets and reps each day after inputting the days lifting work out. Beyond the whiteboard and my wod are two of the most popular wod tracking apps(iTunes and Android) . It is possible to log daily on an app but you generally have to input your work out each day to something like beyond the whiteboard. This can be tedious and take a good bit of time. 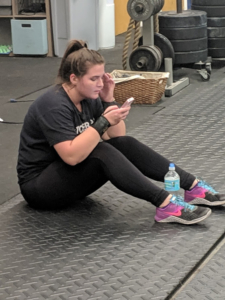 One option if you come to CrossFIt Sarasota or follow our programming is to track with Zenplanner (iTunes and android) . The app is preloaded with the gym’s workout each day so all you need to do is log daily results. You already have an account and it is free to use so this is a great option. If you are looking more to the accountability side of things or if you simply need to track volume there are automatic options. Training Peaks is great for this. This app and others like it are especially useful for anyone training for other endurance events. You can plan your week (or longer periods) and log workouts. If you have a compatible heart rate monitor the app will automatically upload your workout. You will still need to log, at a minimum, wod and strength benchmarks as this app is not great for that. The love of data has spawned countless app for logging health and fitness information. Logging food is simple on app like myfitnesspal. Sleep tracking is generally linked with the ever popular activity tracker. If you have one simply check the connected app and you sleep data should all be there.